Voters in the D.C. area contended with long lines at some polling places Tuesday as they selected the next president of the United States, choosing between Hillary Clinton as the nation's first female commander in chief or billionaire businessman Donald Trump. 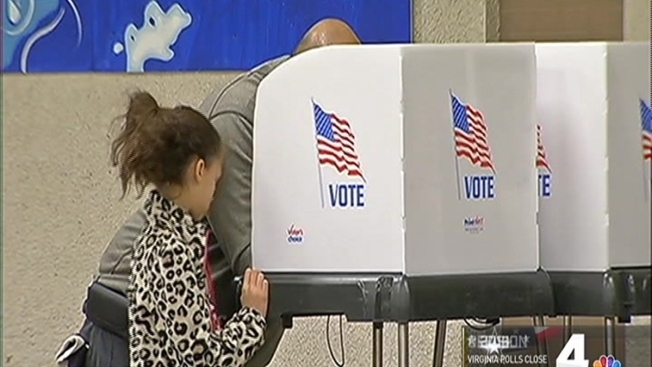 Polls in Virginia closed at 7 p.m.; in Maryland and D.C., the polls closed at 8 p.m. But whether they expressed frustration over a long and often bruising election season, or excitement over a new leader, many agreed the waits at their polling places were worth it to make sure their voices were heard. "It's a really good feeling -- all of us doing something together, the nation coming together," said Dale Brown, a 62-year-old voting at the Hardy Recreation Center in Washington, D.C. "That is something I really appreciate." 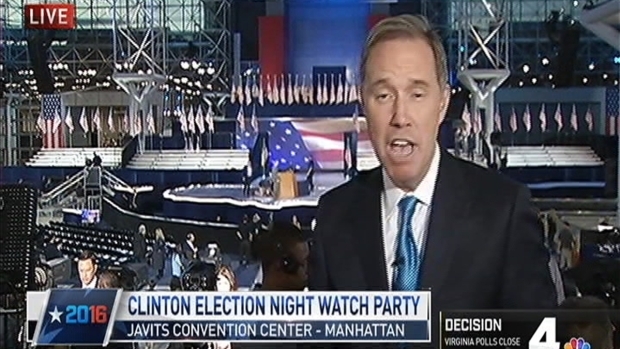 Hillary Clinton's campaign is hosting a watch party at the Javits Convention Center in Manhattan. It's a building that has a literal glass ceiling as Clinton hopes to break the figurative "glass ceiling" to become the country's first female president. News4's Jim Handly reports. "I think this election is really pivotal," said Parker Brill, who voted in Old Town Alexandria on Tuesday. "The country could go in two very different directions." The head of Virginia's Department of Elections said complaints about problems at the polls had not been any greater than in previous years. Department of Elections Commissioner Edgardo Cortes said at a news conference Tuesday evening that among the "isolated issues" were long lines in Prince William and Spotsylvania counties. Cortes said several precincts in Fairfax County didn't properly load their electronic poll book data, so some people who likely were registered were not showing up. He said those people were given provisional ballots and the elections office will work quickly to process them. He says the department also got complaints from some voters who had registered at Department of Motor Vehicle offices but weren't on the rolls. Cortes said that happens every election and an audit process is in place to confirm who registered and process their provisional ballots. The relentless negative tenor of the campaign upset some voters. "I'm so glad it's over. I don't like it," said Brenda Jones, 66 and of Wheaton, Maryland, who was working as an election judge. "There was too much bashing. It was ugly." Still, Jennifer Ibrahim, who voted at Friendship Baptist Church in D.C. on Tuesday morning, said it was important for her to get out and vote. "I came out today because of the importance of this election and for our country what we're facing right now and the polarization of the nation right now..." she said. "People are acting ridiculously; I think it's a comedy show that's not that funny, because it's scary." She said her voting experience was easy. She arrived after the lines had died down and was able to cast her ballot quickly. In Virginia, where the polls opened at 6 a.m., voters were up early and lining up outside some polling places long before the sun was up. 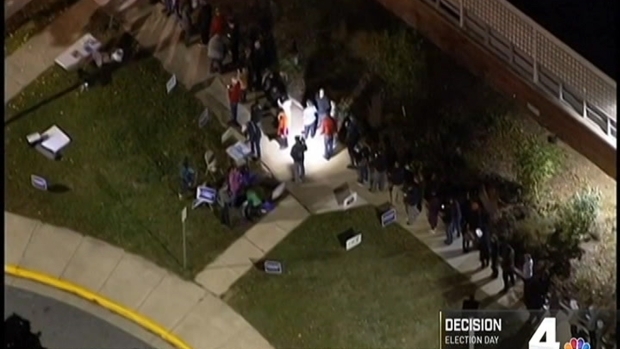 Chopper4 flew over Luther Jackson Middle School in Falls Church as a line of people waited to cast their votes. At Holmes Middle School in Fairfax County, voters were able to wait inside, out of the early-morning chill, with a line snaking up and down the school's main hallway. Some voters in D.C. saw similar lines. Resident Paul Regino said everything went smoothly. "The line was long, but they were very organized inside," Regino said. "They kind of had a system set up for you, and people were very generous in helping you out." Virginia is lining up today at polling places to vote for the next president. NBC4's Molette Green reports. "It's been going pretty well," said poll worker Elaine Ayo at the Hardy Rec Center. "Really crowded in the morning, but pretty consistent throughout the day. Not like any super long lines." Roger Munter of Southeast Washington said he had to wait more than an hour to cast his vote. "It was a little chaotic this morning," Munter said. "This was actually one of the longer waits I've had in D.C. so there was a little confusion in there. But it was fine." In Rockville, Maryland, "The process was very good. It just took me about 15 minutes," said Amanuel Habt, 59, of Silver Spring. Philip Weeks praised the help he and his wife received at their polling place, Friendship Baptist Church. Weeks said his wife, who is undergoing medical treatment, was able to vote curbside Tuesday morning without having to get out of the car. "Now that is what a country and a city needs to encourage people to vote," he said. "...That was the great experience of this day." DC voters got to vote on whether they want statehood - although the vote won't necessarily get the District any closer to that far-fetched destination. While crowds could be a problem at the polls, a record number of local residents took advantage of early voting. Over eight days, more than 800,000 voters cast ballots in Maryland -- far more than the 430,500 people who voted early in the 2012 presidential election. Clinton has also held on to a lead in polls in Virginia, which is the home of her running mate Tim Kaine. Kaine represents Virginia in the U.S. Senate and previously served as mayor of Richmond and governor of Virginia. "I exactly know who I’m going to vote for," said Fairfax County voter Kala Desai. "I’m really excited. I’ve never been so excited." Clinton is expected to easily win the District's three electoral votes. President Barack Obama received more than 90 percent of the District's vote in each of his campaigns. 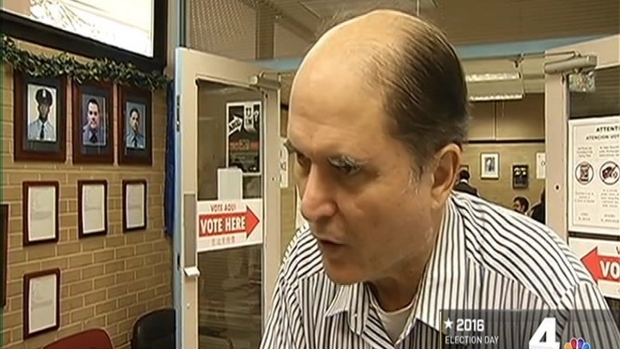 But the third-party candidates on the ballot did capture the attention of some voters. "I think the risk was a lot bigger on one side than the other," said Brill. "This was the first time I actually considered voting for a third-party candidate." Voters in Maryland also will choose who will fill a rarely open Senate seat. Rep. Chris Van Hollen, a seven-term Democrat, is running against Del. Kathy Szeliga, a Republican who is the minority whip in the Maryland House of Delegates. Van Hollen has run as an experienced lawmaker who is willing to reach across the political aisle to do important work. Szeliga has worked to use that experience against him, casting him as an insider of dysfunctional Washington. Northern Virginia has one of the most closely watched races in the country -- Rep. Barbara Comstock's push to defend her seat against challenger LuAnn Bennett. In the District, residents will get to vote on whether they want statehood -- lthough the vote won't necessarily get the District any closer to that far-fetched destination. The statehood referendum provides the most intrigue to a sleepy general election in the nation's capital, where Democrats outnumber Republicans 12-to-1. The polls are open in Virginia until 7 p.m. and in D.C. and Maryland until 8 p.m. Check NBC Washington's Election Day voting guide for help finding your polling place. Teaganne Finn, Sara Wise, Natalie Hutchinson and Amaya Turner contributed to this report.